Finally, on July 29, 2007, after having postponed the event from July 15th due to the expected arrival of Typhoon #4 on that day, we held our first trip to Universal Studios Japan. Link: http://www.usj.co.jp/ Although we expected the crowds to be large with school being out, it was not bad at all. Our wait times varied from 30 mins. to about 1 hour and we somehow were able to survive the heat and humidity. 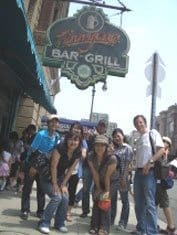 The first place we chose to take a group picture was in front of “Finnegan’s Bar & Grill” which is well known by all the students from the lesson routine that we do at Smith’s called “Finnegan’s Bar”. I just had to take a picture in front of that bar (see picture at the top). We enjoyed the shows on the street and most of the popular rides including the “Hollywood Dream” jet coaster, “Back to the Future”, “Jurassic Park”, “Spiderman ? the Ride”, “Jaws”, “E.T.”and “Backdraft”. All together we spent about 9 hours at USJ and the wait times gave us some time to practice a little English. I tried to spark this by asking movie trivia questions but found that some of the movies were from a time before my students had been born, so they, of course, did not know that answers. However, it was still great fun for all! We enjoyed eating pasta together just outside the park. The “Hollywood Dream” jet coaster was a rush. (See art–like picture at the top.) This was the first ride we took and we really did not have to wait at all. We all enjoyed this ride a lot. Everyone came out of it with the same hairstyle….all back! Here we are in front of the “De Lorean” time machine. I tried to explain to the students that this rare ‘80’s sports car was very modern for it’s time with its gull-wings and stainless steel body but they did not seem too impressed considering the cars that are available today. 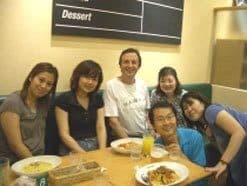 Smith's School of English is really a fun place to learn and practice English and we really care about the students and try to offer them as many opportunities to use English as we can because we know how difficult it is to find the right time or place to really practice in Japan. We often have special events like this to provide students the opportunity to practice and have fun. Nearly every week the “Smith's Okamoto Night Out” event is held. 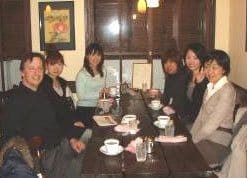 Some of the current students of the Okamoto school and the owner/teacher, Mr. Bartle, meet at a local coffee shop for free talking in English. The event is attended by different students each week and is open to some prospective students also upon invitation. This is just one example of how Smith's School of English differs from the other large corporate English Schools. And Smith's School of English is one of the only true monthly tuition schools. Experience the Smith's difference. The monthly tuition payment system fits the lifestyle of our students. Ticket/Point style of payment is far from reality and does not take into account life changes that happen all the time for our students. We are happy to provide a much more practical alternative for our students.Smith's School of English cares about our students.